Have you considered helping ThunderCon grow and attract new and exciting celebrities, industry artists, interactive programming and more? This year we have 2 ways you can make a big difference and we are infinitely grateful to anyone who considers them! The first way you can make a difference is by becoming one of our esteemed volunteers. at doors to cosplay costumers for promotional events. 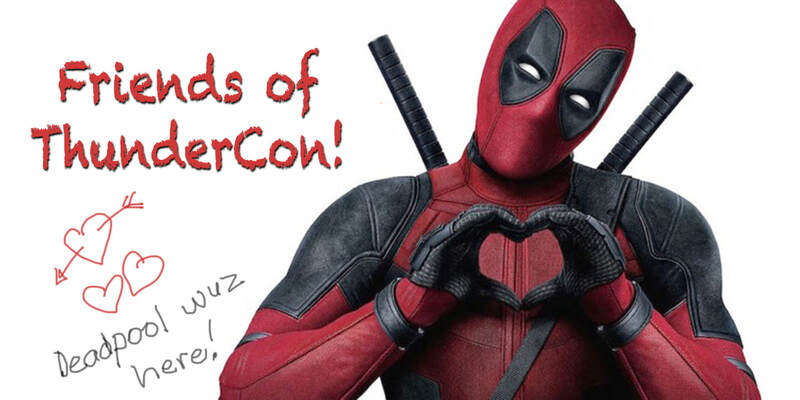 If you would like more information on volunteering please contact volunteers@thundercon.org. The second way you can make a difference is to become a ‘Friend of ThunderCon’ by donating $50 with the link below. the past and current Friends of ThunderCon. but there is so much further we could go to provide some truly amazing experiences. helps secure the future of ThunderCon as an annual landmark for Thunder Bay’s event schedule. Click Deadpool below. Follow the pointy bits. It's like the cost of a chimichanga, and maybe a unicorn. ​Get Your Geek On, Thunder Bay! 2018 at the Valhalla Inn!